Chor Minor (alternatively known as the Madrasah of Khalif Niyaz-kul) is a building tucked away in a lane northeast of the Lyabi Hauz complex. 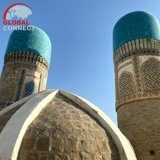 The structure was built by Khalif Niyaz-kul, a wealthy Bukharan of Turkmen origin in the 19th century under the rule of the Janid dynasty. The four-towered structure is sometimes mistaken for a gate to the madras that once existed behind the structure; however, the Char-Minar is actually a complex of buildings with two functions, ritual and shelter. Each of four towers have different deco rational motifs. Some say that elements of decoration reflect the four religions known to Central Asians. One can find elements reminiscent of a cross, a Christian fish motif, and a Buddhist praying-wheel, in addition to Zoroastrian and Islamic motifs. On the esplanade to the right from Chor-Minor is a pool, likely of the same age as the rest of the building complex. Chor Minor is now surrounded mainly by small houses and shops along its perimeter.